In his Parisian atelier, Xenakis—Greek composer of some of the most thrilling and disturbing music of the last 100 years—always had to hand a slide rule, an electronic metronome, a stop-watch and at least one book by Plato in the original. His workspace looked more like a factory than a studio. Being without attachment to a particular style, school or movement, Xenakis personified the political and social struggles of post-war Europe more intensely than any other composer. His music actually has no content at all—it is pure sonic energy, a revelation of the deep mathematical structure of the world and the universe. His music is governed by geometric shapes, statistical laws and the forces of nature—the patterns found in tree branches, clouds and coastlines. Although his artistic thinking had its roots in Greek philosophy, architecture and literature, his imagination was as daring as any science-fiction writer. He is a complete one-off, without any antecedents at all and we will probably never see his like again. He left Spetse in 1938 and set off for Athens, where he enrolled at a prep school in order to prepare for the engineering course at Athens Polytechnic. In his spare time, he also studied harmony and counterpoint privately with Aristotle Koundourov. It was at this time in his life, aged 16, that Xenakis fully engaged in his Greek heritage. ‘I felt I was born too late—I had missed two millenia. I didn’t know what there was for me to do in the twentieth century. But of course there was music and the natural sciences. They were a link between ancient times and the present, because both had been an organic part of ancient thinking.’ He immersed himself in the writings of Plato, Thucydides and Xenophon. He adored the Greek poets, particularly Sappho, whom he read in the original Aeolian dialect. He visited the sites of ancient events, including several trips to Marathon, where he ‘projected’ himself into that age. He would cycle to these places and camp out at night, listening to the wind, the crickets and the sound of the rain on his tent. At the same time that he was engaging with ancient Greek civilization, Xenakis was also falling in love with nature and, if anything could sum up his musical vision it would be this dual love of this Greek heritage and the natural world. He once described being caught in a storm out at sea in a small rowing boat. The waves, rain, thunder and lightning. The experience left a deep impression on him and he said that he wanted to make those who listened to his music feel the same sense of awe and terror. This idyll was shattered in October 1940 with the Italian invasion of Greece. The Germans followed six months later. The Resistance in Athens began to organise itself, which Xenakis joined and stayed with for three years, helping to organise demonstrations, making speeches and mobilizing public opinion. In July 1943, Italy capitulated and retreated, followed by the Germans in October 1944. When, three days later, Churchill sent in British troops to quell the Communist uprising amongst the Greek youth, Xenakis then found himself unthinkably fighting the British. During the ensuing street battles in January 1945, Xenakis was inside a building when a shell of a Sherman tank hit it. The explosion caused a huge splinter to enter and destroy his left cheekbone. His left eye burst out of its socket. His palate was pierced and his jawbone broke. He started choking on his own blood and vomiting. He only survived due to the help of a woman named Mâkhi (after whom he named his only daughter). His father, who was searching for him everywhere, bribed a police officer to help him and together they found him and moved him to a hospital. After the British withdrawal, a fascist military junta was put in power and death sentences were issued against those who had been involved with the Communists, including Xenakis. He immediately fled the country under an assumed name—Konstatin Kastrounis—and arrived in Paris, via Rome and Turin, on 11 November 1947. He was helped at first by a refugee organisation. He sought work and, because some acquaintances of his worked there, he was eventually employed by Le Corbusier’s firm of architects. In these early years in Paris, Xenakis made his first forays into composition. In 1951, Xenakis introduced himself to Olivier Messiaen and showed him some of his first compositions. Messiaen said to him, ‘You are very talented but you compose in a naïve fashion.’ Xenakis was shocked and dismayed at Messiaen’s frankness, but Messiaen went on to explain himself: ‘You have the good fortune of being Greek, of being an architect and having studied special mathematics. Take advantage of these things. Do them in your music.’ Later on in life, Xenakis said that this encounter with Messiaen was the most astounding interview of his life. Xenakis found himself returning to the sounds of his lonely childhood—flocks of birds, bees swarming in groves—and the sounds of his years in the Resistance—mass phenomena, chaos and violence—and vowed to transcribe these masses and swells of sound into his music. His first piece, named Metastasis, after the Greek Meta (after or beyond) and stasis (immobility) is an exploration of the dialectical contrast between movement and immobility. This problem fascinated the ancient Greek philosophers, beginning with Parmenides and continuing with Zeno and is illustrated in the fable of Achilles and the tortoise. 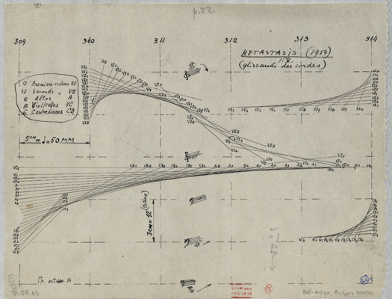 In Metastasis, Xenakis transferred the radiating lines on his drawing board into criss-cross glissandi for the strings. Superimposed string slides, each with a different gradient, create huge sweeps of sound that expand and contract asymmetrically, producing continuous and discontinuous change. This is his famous ‘stochastic’ method of composition, a system based on the ‘calculus of probabilities’ whereby notes are assigned randomly in the manner of Brownian motion of gas molecules or massed blood cells, which create a form resulting not from the movement of the individual but the aggregate. Music is no longer visualised as a one-directional process moving through various stages to a logical conclusion but rather a distribution of vast numbers of sound events. The piece was premiered at the Festival of Donaueschingen in 1955 but the performance was met largely with miscomprehension and indifference. Xenakis, however, knew he had found his way as a composer. At the same time that he was breaking new ground as a composer, Xenakis was working full-time for Le Corbusier. Xenakis was always keen to point out that he was never an architect. He trained as an civil engineer and, at first, he only did stress computations but, more and more, he took part in the actual design work. He contributed to the design of the Couvent de la Tourette but his major collaboration with Le Corbusier was the Philips pavilion made for the Brussels World Expo in 1958. 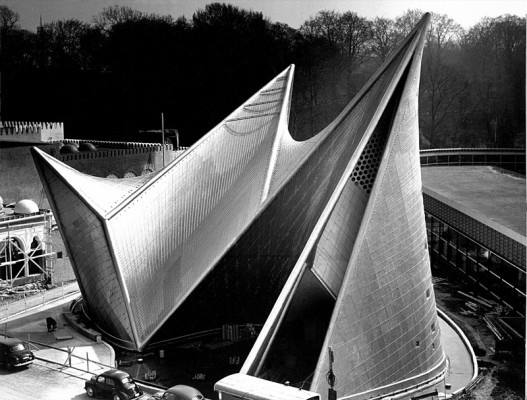 Like Messiaen, Le Corbusier appreciated Xenakis’ singularness and the two had developed a friendship. They also had something very particular in common—they both had only one eye, and neither could therefore judge distance very well. There is a lovely story about how, whenever they shared a meal at a restaurant, Le Corbusier would aim the bottle of wine at Xenakis’ glass, pour and say, ‘Am I in or out?’, to which Xenakis would reply, ‘In, I think.’ But the pair fell out when Le Corbusier claimed all credit for designing the Philips pavilion and gave the younger man no credit at all. For ‘Concret PH’, Xenakis recorded crackling embers from which he extracted very brief sound elements and assembled them in huge quantities, varying their density each time. The resultant two minutes of glistening, granular work is a sound continuum without a single break. ‘Concret PH’ was originally composed to be played in the Philips pavilion (the PH stands for ‘hyperbolic parabola’). Inside the pavilion, more than 400 speakers fitted into the walls and ceilings played Edgard Varèse’s ‘Poème Electronique’ to the millions of visitors to the pavilion. As the tape of the eight-minute piece was being wound back, ‘Concret PH’ was played. Both pieces were played 30 times every day. Xenakis defined the term ‘density’ in music as the number of sound events per second and these tape pieces are studies in white noise and its graduations through the process of densification. He would record sounds on one tape, copy it, edit the copy so that any repetition was avoided and then mix the copy with the first tape. He carried out the same operation with three tapes, then he re-recorded those three tapes on three tape recorders, thus increasing the sound events per second by a magnitude of nine. For this reason, these superdense electroacoustic pieces are absolutely (and intentionally) overwhelming to listen to. Xenakis’ electronic music forms only one-ninth of his total output but his status in the field as a pioneer (along with that of John Cage’s work in the same field) is unmatched. In the late 60s and into the 70s, Xenakis developed his electroacoustic tape pieces on a much grander scale, creating massive alliances between sound, architecture and light. He called these multimedia events ‘Polytopes’. The first of these, the ‘Polytope de Montréal’ (1967), was a performance of a tape piece accompanied by 1,200 sources of light fixed to steel cables so that a kind of transparent sculpture was formed. In 1971, in the Roman baths of Cluny, Xenakis created another Polytope, a multimedia spectacle of 600 strobe lights, 400 mirrors and three lasers. But the most ambitious and dramatic of all of Xenakis’ Polytopes is La Légende d’Eer (1977), written to be played in a special architectural construction accompanied by laser lights and composed for the opening of the Pompidou Centre in Paris, where it was performed for three months in 1978 and seen by thousands of people. The work is projected over seven separate tape tracks, each made up of a mix of electronically generated sounds, noises and instrumental sounds. Although it is a continuous 46-minute piece, there are discernible sections which suggest the voyage of a mythic hero through underworlds filled with demons and Furies of both the ancient world and the world to come. The music is ritual without religion. It assumes there is a man and there is a cosmos. Nothing else. It invites us to inspect the cosmos with fascination, awe, terror even, but without piety. The experience it unleashes in us is the product of our own minds and cultures, with no intervention at all from a God-like presence. The title comes from the final pages of Plato’s The Republic and the legend links back to Xenakis’ war time experiences—the mass movements of people and machines in the darkness and to the play of searchlights over cities under bombardment. It is hard not to link the fate of Er, whose body returns to life after ten days, and that of Xenakis himself, whose wartime wounds were so severe that he was initially deemed unsaveable. It is the most pitiless and brutal of all of Xenakis’ work, the purest embodiment of his musical aesthetic. 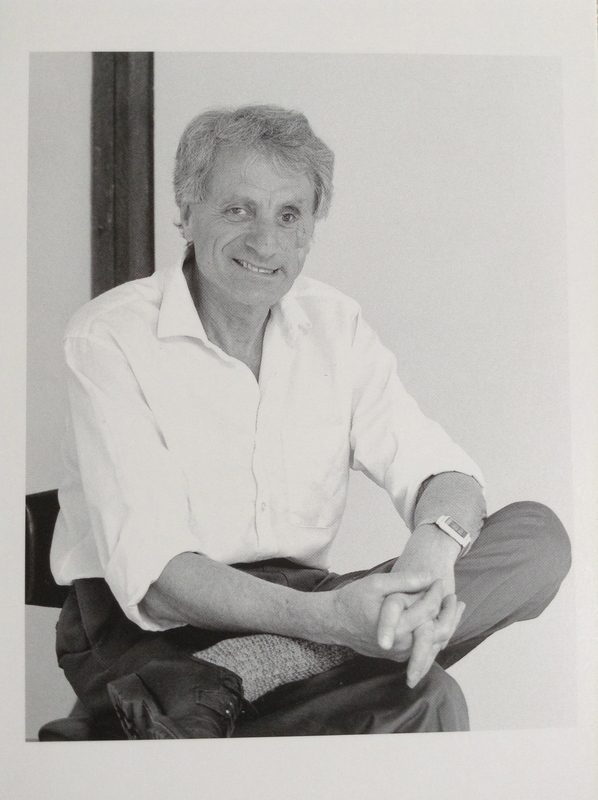 By now, Xenakis was established as a composer and received endless commissions for new pieces. He continued to work solidly, producing numerous substantial works until he died peacefully in his sleep on 4 February 2001. He was cremated at Père Lachaise cemetery, with a wooden oar by his side and his favourite copy of Plato. His ashes were scattered over his beloved Aegean, homeland of his forefathers. Richard Skinner is the author of three novels, all published by Faber & Faber. His poems have been published in a variety of print magazines including Staple, Brand and Magma and a full-length collection, ‘the light user scheme’, is published by Smokestack.